Melt the butter with the olive oil and slowly but completely sauté the garlic and onion in a skillet. 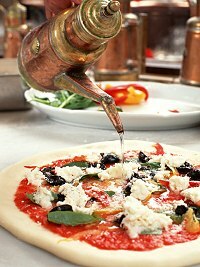 Panning the dough is the step where you use a rolling pin or machines to create the pizza base with your dough. There are machines that help you sheet and pan the pizza dough, or you can use the hand tossing method or the rolling pin if you want to do it yourself. 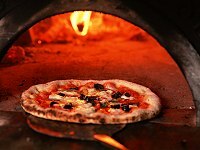 Depending on the style, size, composition and number of pizzas you choose to make, the methods of sizing, shaping, trimming, and ultimately, panning the pizza dough, will vary. First, spread the pizza sauce evenly over the surface of the dough. Spoon the sauce out to the edge of the dough sheet, leaving "un-sauced" about 3/4" to 1" of the dough crust. From this point on, let your eyes, nose, creativity and taste buds take over to add other toppings to your pizza. Some toppings, (fresh vegetables, certain cheeses and fatty meats), are higher in moisture and fat content and you have to take this into account when you use them, to ensure your pizza doesn't turn out soggy. The final step is to bake to pizza. When your oven is at the right temperature place a prepped pizza in the center of the middle rack to allow for maximum air circulation around the pan. Make adjustments to your baking process one at a time until you've found the perfect balance of rack position, temperature and baking time to suit your oven. - Carefully lift the edge of the pizza to inspect its bottom. The bottom dough should be evenly browned. If these signs are evident, your pizza is done!